How Can I Crack NEET PG 2018 With 600 Score? Stress levels among candidates appearing for postgraduate entrance exam NEET PG 2018 are extremely high because securing admission at a good college is one of the most important factors of building a successful career ahead. With pressure levels increasing it requires proper studying and takes a lot of hard work for candidates to crack NEET PG 2018 with 600+ score. However, going through some crucial tricks and tips to crack NEET PG 2018 not only benefit the preparation but also reduces stress levels in candidates. Do an analysis of the score – 600. 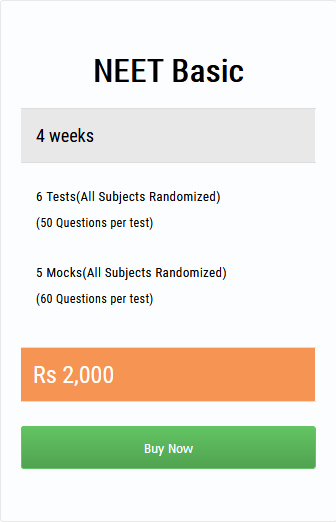 To score 600 in the NEET PG 2018 you should get 150 Multiple Choice Questions correct out of 180, without negative marking. Therefore candidates need to plan it accordingly and decide how much to attempt and score subject-wise based on your strengths and weaknesses. To be on a safer side you may attempt 165 where may be few questions are wrong and for this you need to make sure that your practice fetches you close to 150 MCQs correct. Basically your ability to get at least 150 MCQs correct in NEET PG you need meticulous practice depending on the various subjects and the syllabus. Biology is much easier than in Physics and Chemistry. Hence target to score more in Biology. Gather all the details about the officially prescribed syllabus for the NEET PG 2018 examination. Consider the good preparation books and study materials. You should have a perfect combination of Books and not stress out yourself with multiple books. Instead, you should follow a very simple combination of books. “It is better to study with full concentration for half an hour than studying aimlessly for 5 hours”. Remember this funda always! Practice mock test & previous year question papers. Be sure to throw in a couple of unexpected question also. Make mistakes while practicing, and correct them and never repeat them, this way you learn more. Don’t try to include new topics at the end of preparations. It is easier to discipline yourself if you enjoy the process of learning, practicing and cracking sums. Stay stress free & healthy while preparing for exams. There is a Golden rule which says – “You need to minimize negative marks to earn good marks”. Negative marks can get you down from a big total and thus you need good amount of practice so that you choose the right questions on the exam day and solve them and arrive to a correct answer. Solve the questions you are very sure about first and then go ahead to solve the ones you are unsure. This is just another way of dividing your time. However, beware of leaving aside too many questions unanswered. All you need at this stage is practice! This is the most essential way of minimizing your negative marking. Practice will help you to change your perception and make you confident, anticipate the question correctly. Solving mock papers will help you to manage your time well. Students, you still have time in hand; utilize it for practicing as many MCQs as you can; to expand your spectrum of positive marking. Today, you may be at 5 questions out of 90, but with practice the number will just go on increasing (and that is what counts). You need to practice enough so that you are able to be sure about more questions than before. I love all the subjects and topics. The syllabus isn’t too large considering my preparation time. The level of questions is difficult to crack ONLY in the beginning. After intensive practice, it will be easy, too. Wishing you all the best for all your future endeavors. How To Study for NEET PG 2018, NEET PGCrack NEET PG 2018 With 600+, Crack NEET PG 2018 With 600+ Score, How Can I Crack NEET PG 2018 With 600+ Score?